One of the big changes with the 8th Edition books is that, recognising the expansion of Common Magic Items (all 81), the race-specific selections have shrunk. As part of an occasional series, I'll be looking at the individual 8th Ed books and giving my pick on which is the best magic item for the race from their selection. I'll probably work through in order based on release. 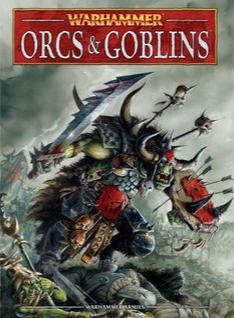 The Orc & Goblin magic items are Shiny Stuff and can be found on Page 74 of their book. Shiny Stuff is limited to eight items spread over the four of the five magic slots (there is no Orc/Goblin Talisman strangely). The choice of most useful (and therefore also most commonly seen) goes to the Lucky Shrunken Head. The Lucky Shrunken Head is an Arcane Item costing 50 points. It can only be taken by a Savage Orc Shaman or Great Shamam but it is a very rare day in the Badlands that you don't see an army with a Savage Orc unit walking around without a mage carrying this item. The Shrunken Head increases the Savage Orcs' 6+ Warpaint Save to a 5+ effectively doubling their survivability. As most "Orc" armies have a horde of 30-40 Savage Orc Big Uns, the head gets a regular run. The item is clearly very cost effective which increases with the size of the unit. Of course it has an entry barrier - 70 points (cost of SO Shaman) - but as most Orc armies want access to the Spells of da Big Waagh, they are taking an Orc Shaman anyway. What this item does is ensure any Shamans are Savage Orc in nature. It is most commonly seen on a Level 4 (increasing the chance of both Foot and Hand of Gork) leaving him with a further 50 points of magic items. As the Head is Arcane, you'll likely find a Goblin/NG scroll caddy in the list. Of the other items in the list, the only other one I have seen used is the Spider Banner. This is very expensive - 85 points - and gives Poisoned Attacks. If the unit already has Poisoned Attacks then these will wound on a 5+ rather than 6+. It can only be taken by a Goblin (not NG) BSB. I have seen this used in a unit of 80 Night Goblin archers in conjunction with the Gift of the Spider-God spell (Little Waagh). One of our locals, Sam Whitt, was using the unit. If you stood off it and were lightly armoured it was brutal. I found the key was to multi charge it with units that could survive the initial onslaught. I agree Pete, Maybe it would be better on Orc archers with the 24" range? I have been experimenting with Morks War banner, and it has some nice combos. Magic items has to be the only part of the OnG book I don't like. As you say, Lucky Shrunken Head is the best, but tends to shape how the rest of the army looks pretty strongly. I've thought about the spider banner and putting it in the SoBunz Star and giving them bows. The unit could shoot reasonably effectively and the banner would help in close combat. What's disappointing is that the 6 other items have almost no use in an all-comers army. It'd be cool to get a bit more use out of the items in the book rather than in the brb. with the large number of high armour monstrous cav i fell in love with my warboss armed with the axe of stunty smashing. an extra attack, strength, and armour piercing meant he was hitting with 5 S7 attacks in the first round, dropping the chickens to a 6+ armour. he was killing one a turn consistently in my 3 games against the empire on the weekend. also a unit of 50 goblin archers with hand weapon, shield, and short bow comes in around 200 points. a unit that with the spider banner can punch above its weight and take some hits in return.